Superb scenery beckons from every viewpoint! The ocean views take in snow capped mountains on the mainland as well as offshore islands blanketed with forested Parks. Golfer's Mecca 16 Courses within 1 hr. Enjoy Beach bonfires, clam and oyster picking or fish for salmon from the shoreline.Kayaking and swim along tranquil beachfront. This region is known as the 'Island's Jewel!' Relax on the landscaped beachfront, and take in the Ocean air while relaxing to the sounds of the waves. Snuggle up to the fireplace or enjoy a wine in the oceanfront Hot Tub. Kids love to adventurer on the oceanfront and discover the numerous species of marine life in the giant tide pools. Hot dogs and Marshmallows are always a hit at the Beach Bonfire Pit. Here in the center of the sheltered east coast of Vancouver Island, you can enjoy BEACH combing, Bonfires, CLAMS and OYSTERS picking, salmon FISHING or rent a kayak, and tour the Islands. View an abundance of marine life including blue herons, bald EAGLES, SEALS, and many other species from the OCEANFRONT HOT TUB, or from the comforts of your patio or room. Enjoy a day of SKIING of SNOW BOARDING 30 minutes north at MOUNT WASHINGTON. Keywords: Beach, Oceanfront, beachfront,resort, cottage, condo, condominium, suites, villa, flat, honeymoon,self catered Ocean, kayaking, fishing, swimming, hiking, adventure, relaxing,clams and oyster picking, beach bonfires. Centrally located to most points of interest on the Island. Walk on waterfront. Walking distance to shops..
Intimate Beachfront Resort property with only 7 suites in total. All oceanfront, ground level with patio's and private entrance. Enjoy the Oceanfront Hot Tub and watch the eagles soar above, as the cruise ships pass. Fresh clams and oysters at your doorstep. Enjoy the tranquil waters to paddle along the shoreline, in one of our kayaks. Four different salmon runs, pass along our shoreline. All you need is a fly or casting rod for an extreme day of fishing. Only 40 minutes to Mount washington for a great skiing or snowboarding adventure. Our Country Village hosts a Grocery Store, Liquor store, Gym, gas station, Pub, restaurants, Cafes, Tennis courts to name a few and are all within walking distance. The Marina is only 5 minutes north, where you can enjoy a great lunch of fresh fish & chips while watching the fishing boats return with their catch of the day.Here you can also set up a charter for a day tour of boating to see the seals, sea lions or a day of fishing. Centrally located for day trips to most of the Islands points of interests We love to explore a new adventure every day. Whether you interests are golf, hiking, winery tours, Spa'a, whale watching, or horseback riding to name a few, they are all accessible from our Resort. Numerous hiking trails through pristine forested Parks. Sixteen golf courses within an hours drive. Enjoy dinner on your private ground level patio, while watching the waves crash and eagles soar. Hot-tub (shared), Kayak Rentals, beach bonfires, clams and oysters. Fish from the shore. an abundance of clams and oysters on the shore, as well salmon fishing from shoreline. Tide pools with numerous star fish sand dollars and other marine life. Bald eagles, blue herons, seals and otters enjoy feeding along the shoreline. 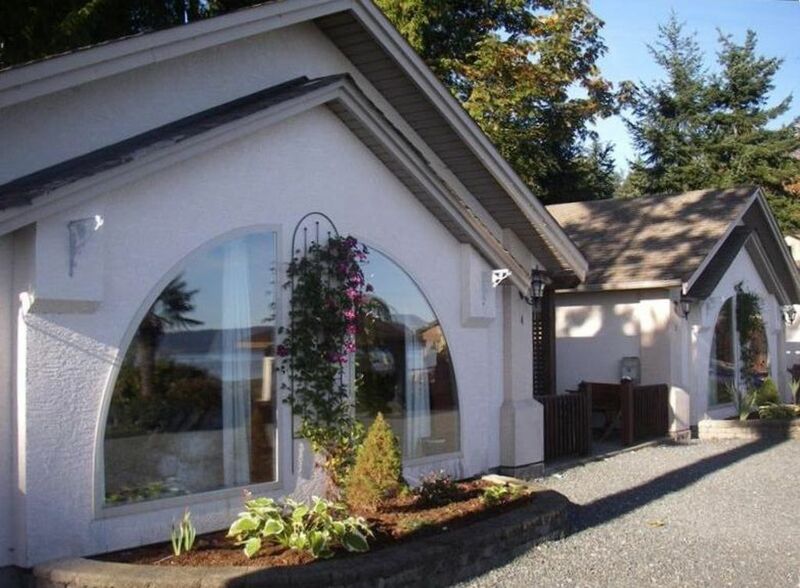 Walking distance to town.Surrounded by 16 golf courses, and an abundance of pristine trails to hike.